Raising meat goats can be a profitable small farm venture. 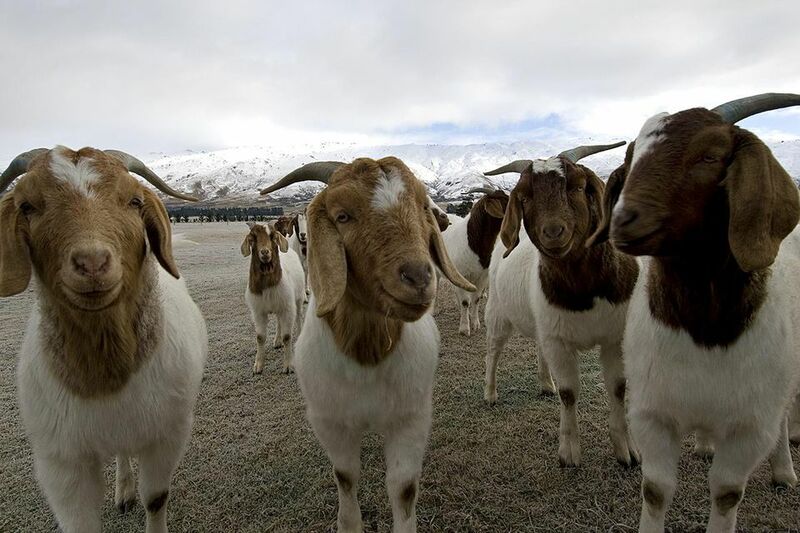 Currently, in the United States, there is a higher demand for goat meat, also called chevon, than there is a supply. Many ethnic groups who live in the United States—from Hispanic to Eastern European to Southeastern Asian—rely on the lean, tasty meat as a protein staple. Raising goats for meat involves a variety of decisions: choosing a breed, deciding on housing and fencing, and finding a market for your goat meat, to name a few. It also means providing your goats with proper food, forage, and health care. When raising goats for meat production only, you'll want to consider mixed breed does and a full breed buck. Or, rent a buck so you don't have to maintain one on your farm. If you want to show your goats or if you want to produce registered stock to sell, you will want to consider maintaining your own buck. But if you're just starting out, consider starting with all does or wethers. Certain breeds, particularly Boer, have been developed with an eye toward meat production. These goat breeds put on weight quickly, instead of producing lots of milk. Some breeds are dual-purpose, meaning they produce plenty of milk as well as put on weight well. Many meat goat farmers have crossed meat breeds like Boers with dairy breeds like Nubians to improve certain qualities in their herd. Meat goats need a clean, dry, draft-free shelter. This can be a simple three-sided structure or it can be a fully insulated barn. If you will be raising kids in the winter, you will want to have a clean, warm building for this purpose. Fencing needs to be sturdy and strong for goats, who will make the most of any breach in a fenceline. Goats need access to a lot of land ideally for forage and pasture. You may want to combine perimeter fencing, which goes around the outside of your property to keep predators out and farm animals in, with interior, temporary fencing for smaller paddocks to keep does separate from bucks and, if needed, kids separate from does. The best meat goats will be raised primarily on forage: shrubs, grasses, and small trees that exist in the woods and in overgrown fields. Unlike cows or sheep, goats cannot live on grass alone. And if you're putting meat on goats in a production setting, you will want to make sure that their forage is dense and high quality to ensure that they put on weight efficiently. You may need to supplement with hay or pelleted feed in some cases. Keeping meat goats healthy starts with a good foundation: the proper housing, fencing, and feed, as detailed above. But there are usually other issues to consider as well, and no one has perfectly healthy animals all the time despite the best conditions. Learn how to care for your goats' health so that you can nip any problems in the bud and prevent communicable illness from ripping through your herd. Finding a buyer, preferably a distributor, for your goat meat is key to your success in making a profit and moving forward with your business plan. Learn what markets are available for your product, and plan accordingly.